Once you take a look at the pictures below you will begin to understand the uniqueness of this farmhouse located near Port Perry, Ontario, Canada. While many new homes are finished with modern materials like vinyl siding and asphalt shingles, the owners of Walnut Farm chose to take a different approach when building their forever home. 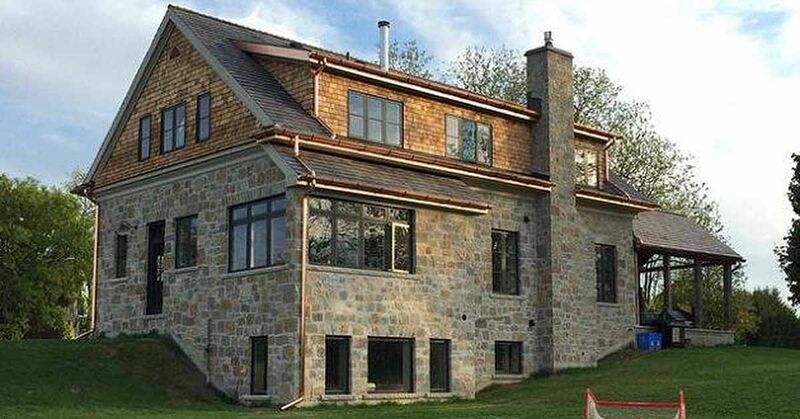 The stone exterior of the home was constructed with the careful, and experienced, hand of a local stone mason. The cedar shingles and gables, as well as the copper gutters, reference the quality of homes built centuries ago. The interior of the home continues in the style of the exterior with its combination of modern and rustic materials. Concrete floors create the foundation of the main floor while antique doors, salvaged from an 1800's farmhouse, provide a passageway into the rooms on the second floor. Every detail of this home has been thoughtfully laid out and carefully constructed with many details made by the homeowners themselves, Angela and Josh Wheeler. For example, when searching for the perfect door for the front of the home Josh took it on himself to design and weld a custom steel and glass door to suite their needs. The end result (as seen below) is breathtaking. This home has so many wonderful architectural details and finishes that it deserves a second look (or even a third). The front porch features a custom-built, steel and glass door that creates an easy transition between outside and in. Just inside the front door is a spacious entryway that has been accented by a rustic console table and natural fiber rug. The kitchen range hood provides a striking centerpiece for this open concept kitchen/dining space. The pantry is located just off the main kitchen area and provides additional space for storage. The hard concrete floors in the living room are offset by soft furnishings, floral drapes and a large, fluffy area rug. The master bedroom, still a work in progress, contains a combination of modern and rustic elements. Neutral accents and classic materials make this second-floor bathroom the ideal place to relax at the end of the day. The trunk, a family heirloom, makes a great alternate to traditional storage options in a young boy's room. The family atmosphere of this open-air porch would make it hard to leave on a beautiful summer day. Take a moment and share the beauty of this newly-built farmhouse in Ontario, Canada. With some parts of the country home dating back to the 1600s, this home has a rich past and promises an even richer future.